Ugggh…performance review time again! I must admit, I have been that person that developed and launched that exhausting quarterly review process in your company. You know the one with the long form that you and your Manager complete in advanced of that not-so-comfortable meeting to see if you feel the same way. Can you imagine if we did this in our personal relationships? Try telling your spouse or best friend that you are going to meet next week to discuss their performance and see how well that is received. Why do we do it with the employment relationship? 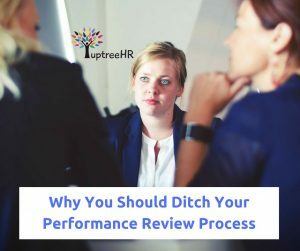 I think it’s been fairly obvious for years that employees and managers do not enjoy this process but let me share a little secret with you – HR hates it too! Yes, the very people that make you do it don’t get any enjoyment from it. Who enjoys nagging managers to do complete forms, address issues and follow up on development that may or may not be relevant. We don’t like policing processes just as much as you don’t like being policed. Managers find it uncomfortable because it is an unnatural way communicating with employees. Who wants to sit down and check off boxes or rate people on a scale of 1-10 anyways? And employees, well, even the team superstar has a little bit of anxiety walking into that office. What if I am not a good as I think I am? What if I am not considered for that promotion? Basically, this process is causing stress all round. I can not tell you how many times a Manager has come to me saying they have to terminate an employee because they can’t do their job or they have a horrible attitude, but when I look back at their last performance review, they appear stellar. And guess what, we gave them a wage increase too! Many Managers are just not comfortable with conflict and this formal process intensifies this discomfort. A friend of mine named Alex has worked for the same company for 15 years in several different roles. Over this time, he has had 5 different Managers. Every year they sit down and the review goes well. All ratings are at or above expectations but every time the Manager makes a comment that Alex does not respond well to change. Every year for 15 years, different Managers have had the same opinion. I suspect Alex has difficulty adapting to change, but nothing has ever been done to resolve the situation: no coaching, no training, no consequences. In fact, it is never mentioned again…until the next annual review. Unfortunately, this is all too common. Managers will talk to me about their employee issues and so often the conversation ends with “I will discuss the issue at their next performance review”. Really? Why not address it right now and fix the issue? Studies have shown that coaching is much more effective when it is specific and immediate. Waiting only reduces impact and frustrates all involved. I truly believe the best way to lead employees is through constant and deliberate communication. Actual conversation where you can recognize, engage and manage in one easy step. To learn more about an easier and more effective approach to managing performance, I would be more than happy to connect. Sarah Mullins is the founder of uptreeHR, a Halifax based human resource consulting firm that is passionate about helping business owners manage their people, set clear expectations and increase performance. We truly believe you can treat your employees well, create an amazing culture and not break the bank. To book a complimentary 30 minute consult with Sarah, click here.